Easy ways to reuse empty containers around your house. Get inspired to put your empty containers to good use! Organization made simple. Why do we toss away perfectly good Tide pod containers, coffee cans, and the like–and then go buy storage containers? I love to reuse empty containers! For some motivation, I’ve complied a list of cute, economical ways to reuse containers. Check it out! Alyssa is one of my favorite DIY gals. Her crafts are oh-so-easy and always turn out cute. Here, she covered cardboard boxes with fabric to make those fancy storage boxes that can be quite pricey. AND she only used hot glue. Love it! This site has printable labels to help you reuse those bulky coffee containers. Awesome! These plastic canisters are unrecognizable with spray-painted lids and DIY labels. Much cheaper than the store-bought containers. So, how do you remove the writing on a container in order to transform it?? So simple…use the acetone trick explained here. This one has made the Pinterest rounds, but it’s still a golden idea. Reuse a container and plastic bags! Stylish & thrifty. Awesome idea for empty plastic bottles. And those baby wipe containers! Don’t throw them away when the middle part starts to tear. They make great, sturdy storage containers for other kid stuff. Same goes for Magic Eraser containers. 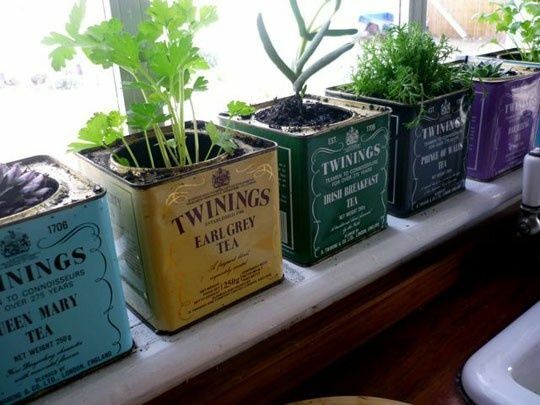 Of course, if the container is already darling, like a candle jar or these tea tins, keep them around as decor. Such a cute little herb garden! Looking for more inspiration? Check out this fabulous list of *10* Creative Ways to Reuse Tide Pods Containers. Ummm he should be thanking you??! :) Thanks for visiting, Emily, hopefully you got some good ideas! I have been saving the huge containers from our Costco peanut butter pretzels (we were a bit addicted for awhile there, but it’s under control now), and I wasn’t sure what I was going to do with them. Now I do!!! Thanks so much! I’m constantly saving containers, like hmm, what should I do with you?? It’s fun to make something out of “nothing”. I have containers all over the place! I am all about reusing and reducing! Check me out sometime: http://www.re-creations.biz. Thanks for the ideas! You didn’t mention glass jars! They’re my favorite for storing leftovers, bulk foods, bathroom things like cotton swabs, and pencils. I rarely break one; they’re really pretty sturdy. You have a lot of great ideas here! I love those big plastic coffee canisters, but I don’t buy that kind of coffee myself (I buy the organic fair-trade kind) so I peek into recycling bins at work and church to snag those canisters when they come along. They’re good for food (as long as you don’t get mice! Mice can chew through them!) and also for small toys like Lego sets. I love this round up! We have so many empty large yogurt containers (We eat a lot of yogurt around our house! ), and I love the tip about getting the writing off with acetone. I know! Where has that tip been all my life?? Great roundup of ideas!! Makes me realize my pantry could use a little help and these are some great, cheap ways to get organized. Thanks for sharing! Any ideas on how to get certain scents out of containers …especially coffee ….LOVE these ideas! This sounds a bit too good to be true, but if you put a wad of newspaper or a clean coffee filter into the container & seal it up for a day or so, the paper will absorb the scent! Another way is to put the container outside (make sure it’s sunny weather, if you live in the midwest like me) and the sun will warm the container and remove the odor. Good luck and thanks for stopping by!